Publication dates (by order of appearence...) : 1919, 1924, 1911, 1930, 1936, 1937 and 1945. Do you know of other B.O.P. with a rugy cover ? Let me narrate a cool story that let us uncover this rare and beautiful French international cap yesterday! I was invited yesterday with four other blokes at the Stade de France to support my long-time favorite Stade Français in a "live twitt" contest vs the other Parisian rugby team Racing Metro, the modern successor Racing Club de France which was celebrating its 130 years on this occasion. - Great ! do you know about his rugby career, or has he left some memorabilia ? - Great move, do you know what kind of cap it is ? - Well no, it's white, with a blue + a red ring. And a golden tassle as well. Any idea ? 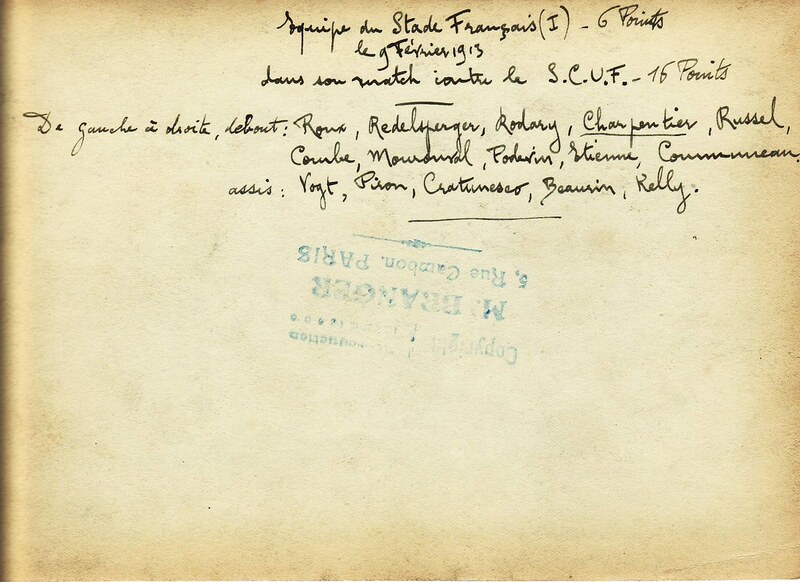 (*) The funny thing is that Besset had never been a member of Stade Français, except some kind of honorary membership after his sporting career like the document Fred showed me. Besset was a player, and then an official - President after ww2, of SCUF (Sporting Club Universitaire de France). 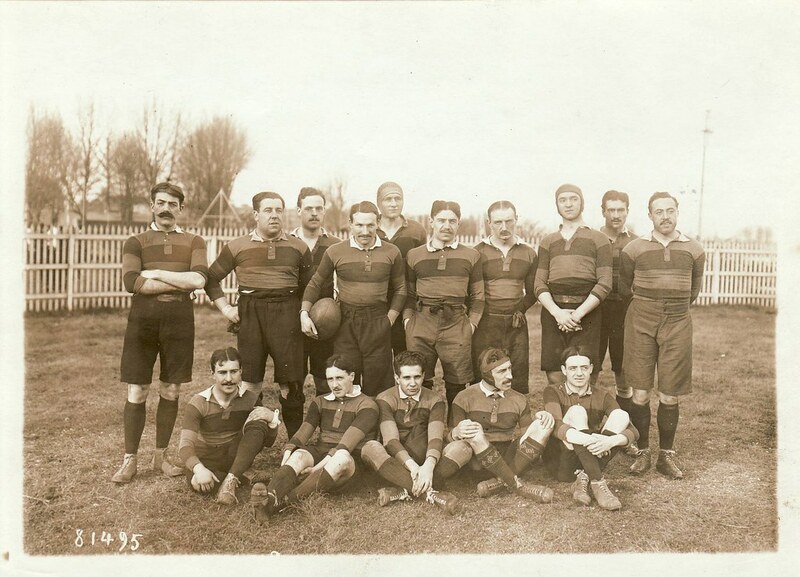 Please read his full bio here on SCUF website, and check this team picture of the finalists of 1913 French Championship lost to Aviron Bayonnais. Fly half Besset sits on the ground, just below his captain and scrum-half André Theuriet. Cool story, isn't it ? 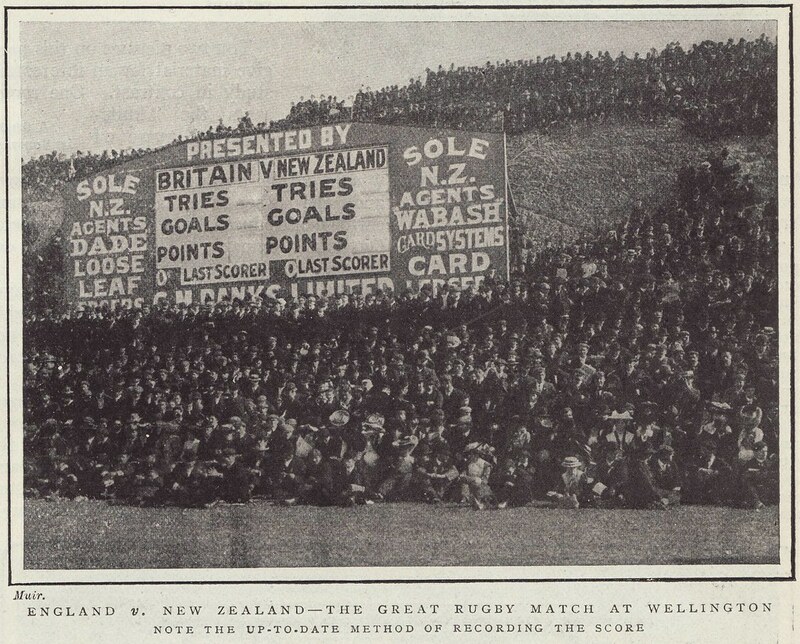 Another fine rugby advertising print ! In Boy's Own Paper c1920. 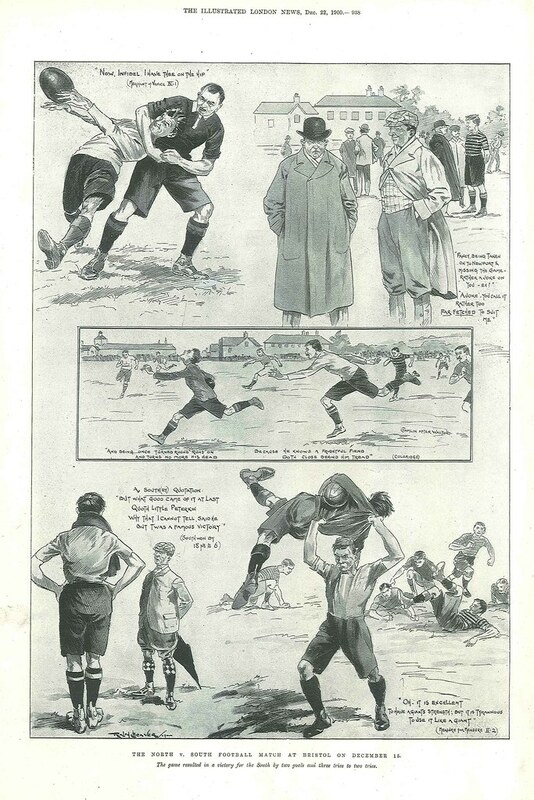 Just a quick snapshot... a quality reproduction of one of the most famous English (*) rugby artwork: the "Roses Match" by William Barnes Wollen, showing action from a match Yorkshire (in white jerseys) vs Lancashire (in red and white hoops) played at Park Avenue in Bradford in November 1893. It has yet to be framed! 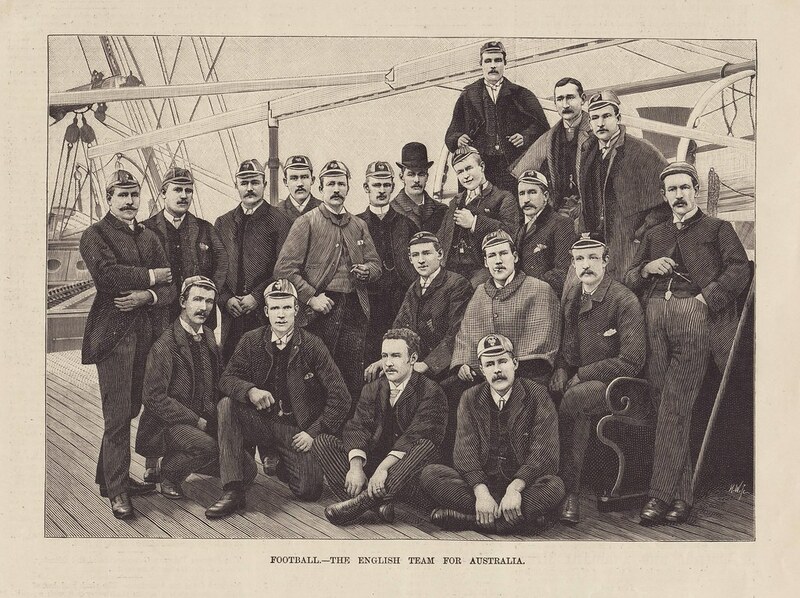 Edit : the World Rugby Museum at Twickenham also brings a very detailed story (yet unsigned... ) about the painting, its history and the controversy about the "Ghost Player"... another must-read! And credit to Sean (rugbeia.com) for this candid - but so true! - motto that he posted a few days ago on his Twitter thread (@rugbeia) !! 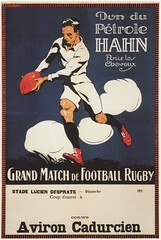 A Photoshop (actually Gimp...) effort from this nice French advertising print c1925... Petrole Hahn (a hair lotion) was sponsoring and financing these posters that were given away for free to clubs, which were then able to print their own text in the lower part left blank. 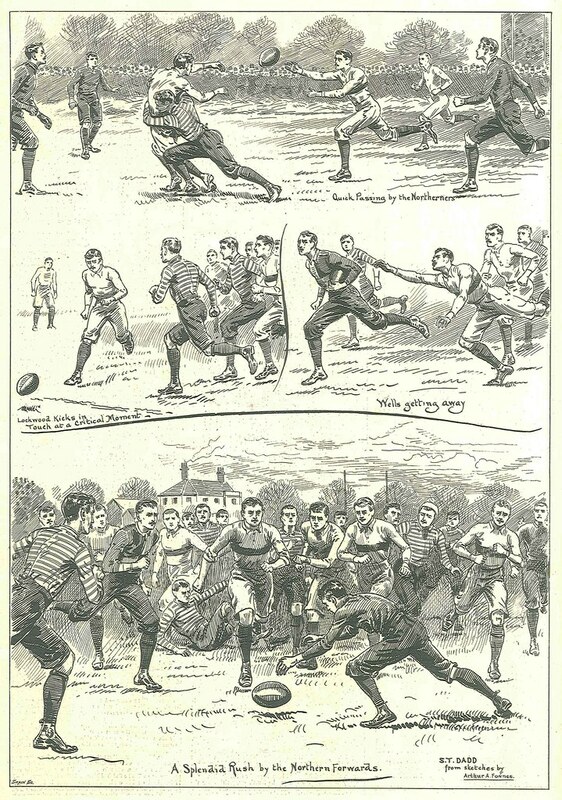 This print is refered to us by historian and rugby writer Ron Palenski in Otago who owns the original adversitising print. "Refreshing, Delicious and Restorative" for the first drink... a "splendid winter drink" for the other bottle... Make up your choice! This is a fine French postcard illustrated by E.Blanche, part of a series dedicated to Olympic sports... and quite hard to find (got this one in Italy...)! 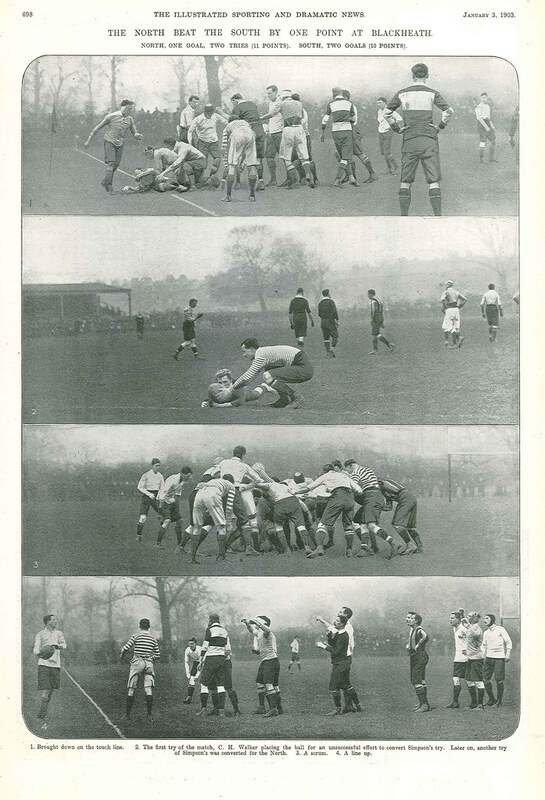 Just to compare... below are the real guys who played 1924 Olympic rugby final (cf video here), René Lasserre for France, Colby "Babe" Slater for USA, and Welsh referee Albert Freethy - the first referee to send off a player in international rugby (it was All Black Cyril Brownlie v England, Twickenham, 1925)! Sorry, they are not naked! 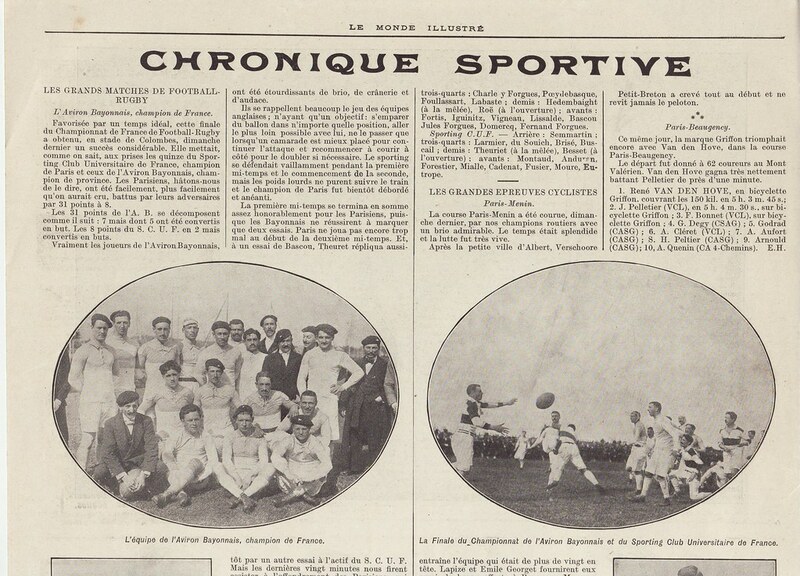 I have three favorite "research" topics when digging into the history of early French rugby. Let me zoom and pay a small tribute to John James KELLY, sitting on the right. 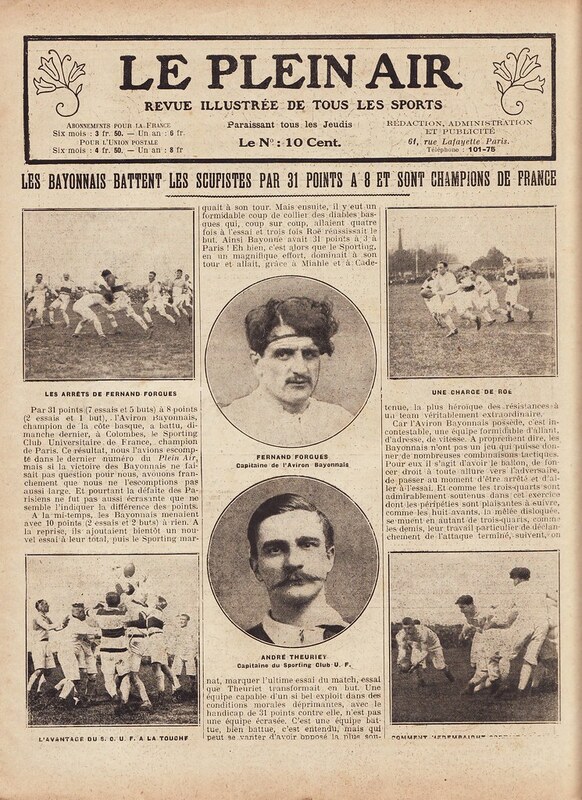 J.J. KELLY appears on the "WW1 Roll of Honour" of Stade Français among the 30 rugby players killed during the Great War. Accoring to Commonwealth War Graves Commission, J.J. KELLY died, aged 26, on April 12th 1917 in the Battle of Vimy Ridge. He was Captain in the Leinster Regiment (2nd Bn). He was the son of John and Jane KELLY, Cork... an Irish gentleman then ! KELLY was the editor of "Continental Daily Mail" in Paris and apparently well known in the press community, as per this notice published in Le Figaro (April 29th 1917). Second, I'm realizing that Dave GALLAHER and J.J.KELLY shared a similar fate during the War... they died approx. at the same period of the War (April and October 1917) and in the same area (70km between Vimy and Passchendaele: map). Both rest in peace near the battlefields, respectively in Poperinge (Nine Elms) and Lievin.